A 6 x binding post wall plate (3 x red, 3 x black), single gang faceplate. No soldering required, simply feed the speaker cable through the clamp and twist tight. 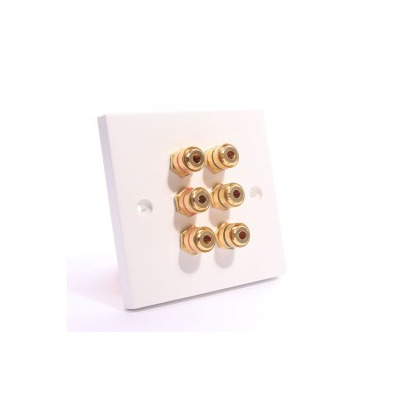 Premium quality surround sound speaker wall plate outlet with 6 binding post connectors. This Speaker faceplate has six sockets presented on the front of the outlet. This surround sound outlet is ideal for using with professional audio surround sound speaker / audio systems in the home, business and commercial environment. The 6 x binding posts connectors have a combined screw clamp and a 4mm top entry hole for banana plugs. It features an M6 mounting threads, insulating washers, gold plated with red and black coloured rings. Cable entry: 5mm O.D. max. RCA connector is a gold plated solder connector.